At the 2016 Chicago Auto Show, Chevrolet took the curtains off from the Chevrolet Camaro 1LE 2017. Company presented this performance version of the sixth generation Camaro with upgraded interior, better handling and lot more. 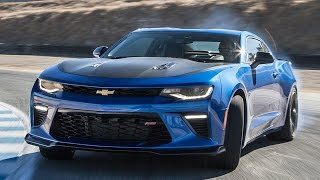 Let us have a look at the review of Chevrolet Camaro 1LE 2017 to know in detail about it. With the 1LE package, the interior of Chevrolet Camaro 1LE 2017 get some great upgrades. Entering the model you’ll notice the heavily bolstered seats. In front of it is the suede covered steering wheel and shifter. To add to your driving experience company has also added its Performance Data Recorder. With the help of this, you can record the video of the trip and thus later statistics like, speed, lap times, engine revs etc can be attained. The dashboard receives redesigning work to suit this new package while the infotainment screen gets a larger stance for better access. Behind that flat bottom steering wheel, there is instrument cluster with two massive gauges and a TFT display amidst them. 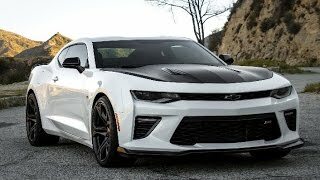 Thus rounding up the interior details of Chevrolet Camaro 1LE 2017 I’ll call the package worth a glimpse for the sport lovers. The exterior of Chevrolet Camaro 1LE 2017 gets few noticeable differences for the SS and standard version. The former comes with the exclusive front end with massive openings in comparison to later. The inclusion narrates the barbaric power it has beneath the hood. The front splitter, rear spoiler and side mirrors get the satin black accents while the hood comes dipped in same. Beneath are the 20” wheels that add the sporty touch. Talking about the standard Camaro we have the satin black hood while the body color is different. The standard version too gets the 20” wheels featuring 10-spoke design. You can also notice the redesigned grille which now feeds more air to the powerful engine. 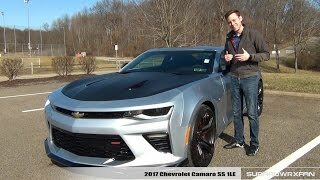 Thus rounding up the details of Chevrolet Camaro 1LE 2017 I’ll call them sporty and luxurious. 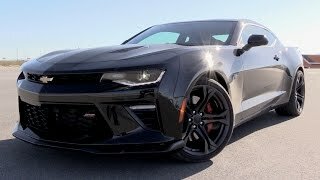 Powering the Chevrolet Camaro 1LE 2017 is a 3.6 liter V6 engine while the SS version hides 6.2 liter LT1 V8 engine cranking total output of 355 hp and 455 hp and peak torque of 385 nm and 617 nm respectively. The performance figures of Chevrolet Camaro 1LE 2017 are still not out, but we expect them to have in near future.